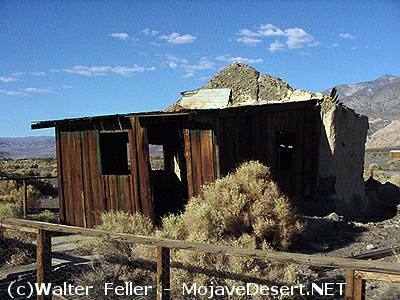 Charles Anthony and John Lampier located the Panamint Valley Mine on July 27, 1893. This mine, also known as the Anthony, Gold Bug, and Knob Mine, is located 3-1/2 miles east of the Post Office Spring in Post Office (now Pleasant) Canyon. A small camp sprang up around Anthony's 5 gold mining claims. Henry Ratcliff worked in Anthony's camp and discovered in May and July, 1896,6 claims east of town which became the Ratcliff (Radcliffe) Consolidated Gold Mines, Ltd. James F. Cooper staked a claim east of the Ratcliff group in 1896, near an old stone corral thought to be built by Indians. The total production for the Ratcliff mines have been estimated from $300,000 to $1,000,000. In 1903 a 3,800-foot tram transported ore from the mines to the mill. An assay office, engine room, blacksmith shop, and various other buildings formed a small camp at the base of the mountain. In 1951, remains at the Ratcliff Mine included a twenty-stamp mill, a 4-foot by 6-foot ball mill, and 4,000 feet of underground workings.